Early on the morning of April 11, Mary Beth Coffey came home to the sound of chainsaws and large pine trees crashing to the ground. Mary Beth Coffey, her sons and family friends say goodbye to an oak tree on her property Wednesday. The tree is on the route of the Mountain Valley Pipeline. Coffey knew, as soon as she read an urgent text from a neighbor and left work in a rush, that it was the day she had been dreading — the day that tree-cutting for the Mountain Valley Pipeline would invade her family farm on Bent Mountain. For three years, Coffey had fought the natural gas pipeline. She spoke against it at a public hearing. She marched against it at a rally on Capitol Square in Richmond. She argued against it when Mountain Valley took her to federal court, where the company obtained an easement through her property by eminent domain. On the day the tree-cutters arrived unannounced, Coffey did the only thing left within her power. She stood as close as she could to the pipeline’s right of way, marked by blue-and-white flagged stakes, and dared the men with chainsaws to keep coming. Eventually, police convinced Coffey to retreat to her driveway, where she watched in dismay as more trees came crashing down. Since Mountain Valley began cutting trees along the path of the 303-mile pipeline through West Virginia and Southwest Virginia, more and more people like Coffey have been standing in the way. The resistance started Feb. 26, when protesters climbed two trees in Monroe County, West Virginia. They have been sitting on wooden platforms high above the ground ever since, in an effort to block timbering through the Jefferson National Forest. Then opponents erected a pole in the middle of a construction access road several miles away, where a third protester has been suspended on a platform since March 28. Then a 61-year-old woman nicknamed “Red” took to a tree stand in the woods of her family property off Poor Mountain Road in Roanoke County. Then two members of her family joined her in separate stands nearby. Opponents on the ground have been roaming the pipeline’s route, listening for chainsaws and rushing to the defense of landowners like Coffey, who have made more impromptu stands. While the protests have caused some delays — members of a chainsaw crew sat on downed tree trunks for several hours Wednesday before Coffey and other protesters eventually backed away — Mountain Valley says the project remains on schedule for completion late this year. Logging is continuing even as the company, in weekly status reports filed with the Federal Energy Regulatory Commission, listed 37 “problem area reports” during a month-long period that ended March 16. Many of the problems involved cut trees that landed or rolled outside of the designated construction area. In three additional cases, the problems were serious enough for Mountain Valley to classify them as cases of non-compliance with tree-cutting rules. But FERC, which is the lead agency monitoring construction of the pipeline, has taken a different view. Weekly environmental compliance reports filed by the federal agency state that there were no problem areas or non-compliance reports during the same month-long period. Many of the trees that fell outside of the construction area were addressed by what FERC calls communication reports. Those reports did not find Mountain Valley at fault because the company self-reported the problems and identified a way to correct them, according to FERC spokeswoman Tamara Young- Allen. “We can interpret the number of self-reports as a positive for MVP for not turning a blind eye to compliance with the commission’s order,” Young-Allen said. Mountain Valley spokeswoman Natalie Cox said the company is working “diligently” with regulators. When the first tree-sitters took their stands, the goal was to form a human barricade that would prevent Mountain Valley from cutting trees until a March 31 deadline had passed. In earlier court proceedings, attorneys for Mountain Valley had stressed the deadline — imposed by federal rules to protect endangered or threatened bats that come out of hibernation in early spring — as the reason it needed to move quickly, first to condemn property from resisting landowners and later to cut the trees that were occupied. March turned to April, and many trees were still standing. But any hopes of a victory by pipeline opponents were diminished when Mountain Valley explained that the March 31 deadline did not apply to all of the trees along the pipeline’s route. Mountain Valley Pipeline markers posted next to signage by pipeline opponents near Russwood Road on Bottom Creek Road on Wednesday. “I think there’s quite a bit of confusion around this,” said Ben Luckett, an attorney for Appalachian Mountain Advocates, which has represented landowners and environmental groups in litigation against the pipeline. In an April 12 letter to FERC, Mountain Valley attorney Matthew Eggerding wrote that the company had felled all the trees identified as bat habitats by the deadline, but that it could continue to cut others along the pipeline’s right of way. For the remaining trees, Mountain Valley is required to check to see if they contain nests or other evidence of migratory birds. If the surveys find no such signs, chainsaw crews have seven days to fell the trees. If the trees are still standing after seven days, new surveys must be conducted. 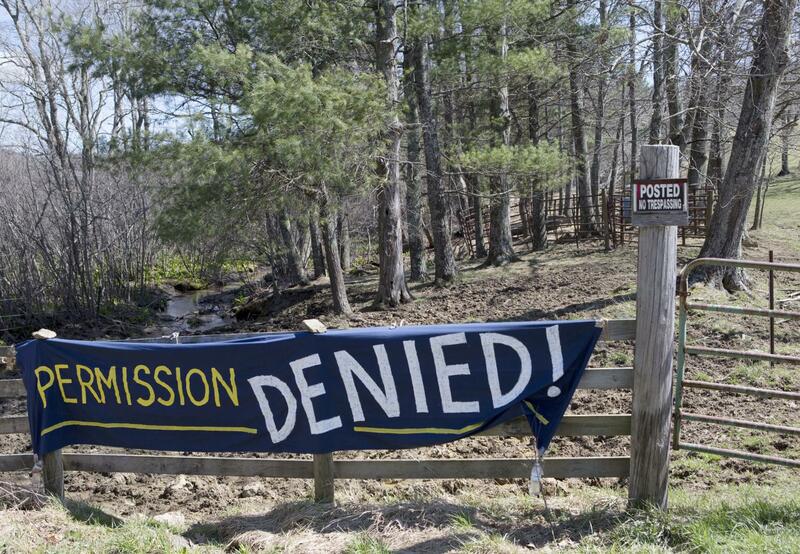 Mountain Valley has until May 31 to complete tree-cutting, a FERC spokeswoman said last week. The deadline is different for the Atlantic Coast Pipeline, a similar project that will run through Central Virginia. More than a year ago, when Atlantic Coast sought FERC’s permission to build its pipeline, it agreed to have all trees cut by March 31, according to Luckett. 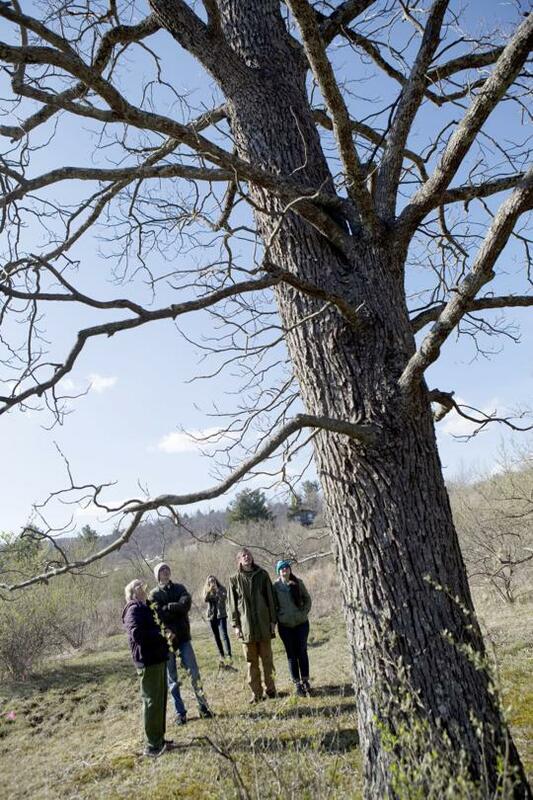 Mountain Valley made no such promise, and instead sought an exception that would allow the felling through the spring of trees not identified as bat habitats. FERC signed off on that plan, even as it later denied a request by Atlantic Coast to continue tree-cutting beyond the end of March. It looked like Mountain Valley was well on its way to having all the bat-designated trees cut in time. Then the tree-sitters atop Peters Mountain complicated things for the company. In seeking a preliminary injunction to have the protesters removed, attorneys for Mountain Valley stressed the March 31 deadline. If the trees were not cut by then, they said, the company would have to wait until November — after the bats return to their hibernation caves — to resume construction, a delay that would cost millions of dollars. But after Monroe County Circuit Judge Robert Irons denied the injunction and the trees remained standing, a Mountain Valley spokeswoman said the company would make adjustments to construction plans to keep the project on track. Irons noted in his opinion that the testimony of company officials must be weighed against the interests they have in the $3.7 billion project. “Each witness has an enormous financial stake in the outcome of MVP, and the Court has to consider their financial interest, in assessing credibility, and finds much of their testimony to be self-serving,” the judge wrote. Landowners say a lack of communication by company officials has only added to the confusion about what Mountain Valley plans to do, and when it plans to do it. Coffey and other property owners have said they received no notice before tree-cutting or surveying crews showed up on their land. Roanoke County officials are equally frustrated, as indicated by a March 30 letter to Grace Terry, a Bent Mountain landowner. Terry complained to the county that a Mountain Valley surveying crew set up camp on an adjoining piece of property, owned by her sister, for an archaeological dig along the pipeline’s route. Terry said the crew neither asked for nor received permission to be on the land. While Mountain Valley was granted access to the property through a federal condemnation order and maintains it was not required to seek permission, county officials sympathized with Terry. “Roanoke County has consistently implored Mountain Valley Pipeline to share information regarding its project schedule with landowners and the public,” Assistant County Administrator Richard Caywood wrote in a response to Terry’s complaints. 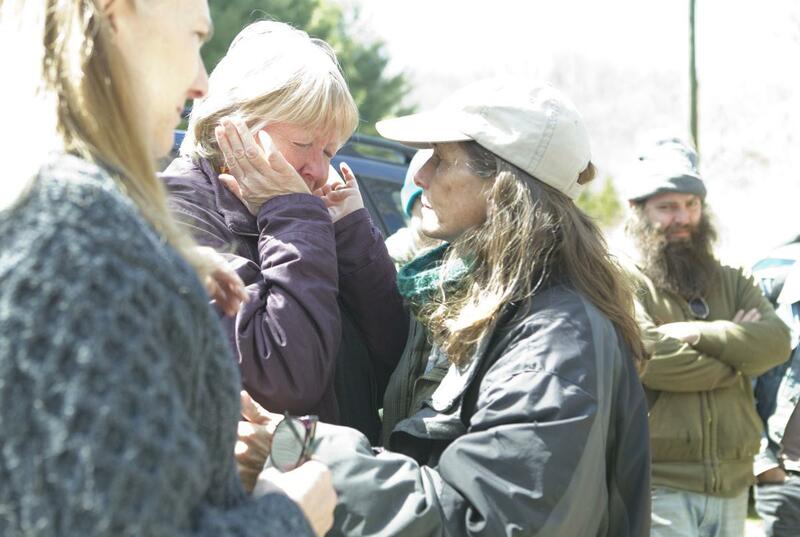 Mary Beth Coffey (center) is comforted Wednesday by Roberta Bondurant (right) and Kathy Chandler (left) amid the noise of chainsaws around her property as Mountain Valley Pipeline crews work to fell trees. 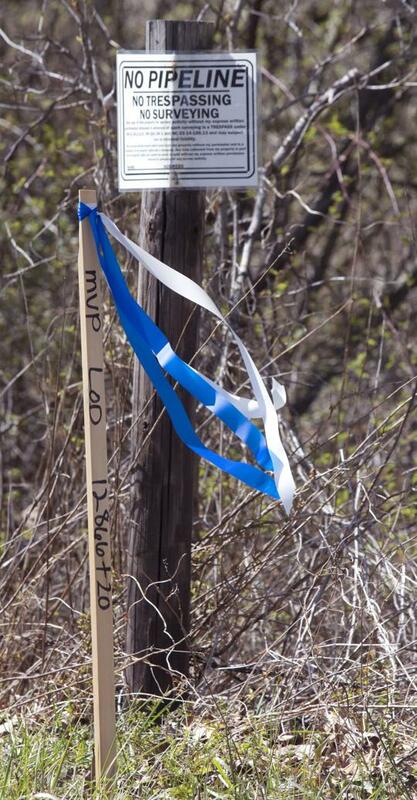 Coffey rushed home from work when she received the news that cutting had begun on her property. “I am beyond my limits of disturbance right now,” Coffey said. So far, work on the Mountain Valley Pipeline has consisted mostly of cutting trees, building access roads and doing other preliminary work along a linear construction zone through West Virginia and the Virginia counties of Giles, Craig, Montgomery, Roanoke, Franklin and Pittsylvania. Opponents say the real environmental damage will come when crews begin clearing land and digging trenches for the 42-inch-diameter steel pipe, which will traverse steep mountain slopes. The fear is that sediment unearthed by the construction will be washed by rainfall into pristine steams, contaminating private wells and public water supplies. To see more coverage of the Mountain Valley Pipeline, including video, photos and a timeline, visit roanoke.com/pipeline. On March 5, a FERC inspector found that erosion control devices were not in place along Pocahontas Road, which Mountain Valley is using as an access road not far from where the tree-sitters are stationed at the top of Peters Mountain. Additional reports recently filed with FERC noted problems with silt fences and other devices meant to curb the flow of sediments. For the most part, though, problems identified so far deal with trees that unintentionally fell outside of the work area. But in at least one case, FERC inspectors found that crews went beyond the construction zone to cut trees without authorization. “The clearing contractor (Northern Clearing) was informed of the noncompliance issue and after an internal investigation, terminated employment for the involved saw hands from the project,” a summary of one inspection stated. Yet there were no non-compliance reports issued through March 17, the most recent period covered in environmental monitoring reports filed by FERC. “Of course, we’d prefer that these things not occur,” Young-Allen, the agency’s spokeswoman, said when asked about the trees falling outside of the work zones. About a dozen complaints about tree-cutting have been made to the Virginia Department of Environmental Quality, according to spokeswoman Ann Regn. The agency is assisting FERC, which has authority over tree-cutting. DEQ is responsible for monitoring the pipeline’s compliance with plans to control erosion, sediment and storm water. It has found no violations so far, Regn said. For people like Coffey who live along the pipeline’s route, environmental damage is but one concern. There’s also an emotional toll that is taken every time a tree hits the ground, sometimes marking the end of a childhood memory or the marring of a home place’s scenic view. “It was very hard on Wednesday,” she said two days later. “I’m better today. But every day I have to go home and drive past what they have done.